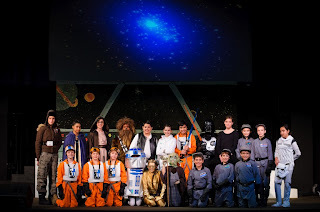 What better way to introduce Dylan to the fine art of live performances than to take him to play put on by children in our community through the Arts and Learning Program ... and the theme of Star Wars was a sure bet to get him interested. Star Wars: Return of the Jedi - The Musical Edition. The perfect mother/son date night. Dylan prepared himself by wearing his Yoda t-shirt and Jedi Academy sweatshirt. So cute! Of course the waiting to get in was a test of his patience, but I knew to go early for the pre-play extras. The play was good, but it was the before part that really got Dylan excited! Real live Star Wars characters ... walking around and taking pictures with the kids. They even had droids, very cool if I do say so myself. We could not take pictures inside, but the ones from before the play are priceless! All characters are volunteers from the 501st Legion and the Rebel Legion who have made their costumes themselves. Darth Vader told me he had over $5,000 invested in his costume. They were amazing! I was able to locate this picture through a promotional site for the play so you can see the actors, all ranging from age 5-13 ... some are natural born Broadway talents!